Ryan (center) dances up a storm with a crowd that includes sister Riley (far left). After Friday’s rocky start and somewhat better ending — including a mutual decision with Ryan’s psychiatrist to leave him completely off medication for now — we headed into the weekend with an open mind. Our plans included a family friend’s bar mitzvah and a Devils game on Saturday — an aggressive social calendar for us. 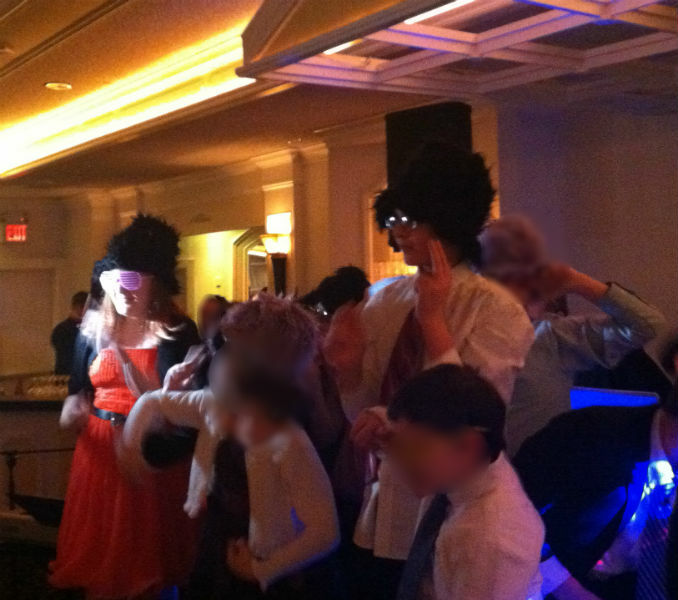 Ryan was open-minded about the bar mitzvah. He knows the honoree, and was excited that the event would have a sports theme. Still, we weren’t quite sure what to expect. We made the educated decision to split up. Riley and Veronica attended the morning ceremony, while Ryan and I waited at home, with plans to attend the reception all together. Really, it was the only choice. Asking Ryan to sit still and quiet through a lengthy ceremony, conducted largely in Hebrew, was a recipe for disaster. Ryan offered no protest as I warned him about the approaching time to get dressed. Not until the time actually arrived, that is. He squirmed and complained as I helped him with his tie. He asked how long the reception would last and was not happy with my answer of “several hours.” He pre-emptively complained of boredom and stated that we would leave long before the end. Arguing with him in that moment, I was pretty sure he was right. But a funny thing happened on the way to a meltdown. Ryan surprised us all by not only lasting the entire time, but by enjoying himself. He availed himself of chicken fingers and fries in the separate “cocktail” room for kids. As soon as they opened the main reception room and the DJ started spinning tunes, he got on the dance floor and never left. He did line dances. He did the Harlem Shake. He did the Wobble. He put on silly hats and sunglasses. If anything, he was over-enthusiastic. During the meal service, as soft music played, Ryan danced. Alone. Veronica and I exchanged looks. Many times. A few years ago, there’s no question what we would have done — pulled him off the floor. Maybe it was the setting — family friends but not a lot of other people that we knew. Maybe it was that our perspective has evolved. Whatever the reason, we let him be. We looked around. Nobody was making fun of him, at least not in any way that we could see. He wasn’t disturbing anyone’s dinner. He was clearly enjoying himself. So we left him. To do otherwise would have been to serve us, not him, and we try not to do that anymore. If Riley was dying of embarrassment, she kept it to herself. I prefer to think she was too busy with her friends to notice. It wasn’t easy, and we fought the urge to sit him down every few minutes. Our perspective on such things is still evolving. Our reward for letting Ryan be Ryan came in several forms. He still asked when we were going to leave, but getting him to stay almost four!!! hours was a relative breeze. Just seeing him “in the mix”with his peers, with a huge smile on his face, was worth the proverbial price of admission. But the best moment came when the DJ called on the kids to grab their parents for the next dance. Ryan came running over to our table. “MOM!” he called while dragging Veronica onto the floor. I’m pretty sure Riley will need years of therapy to overcome her humiliation as a result of me seeking her out — at least that’s what the look on her face suggested. Our son loves to dance. Who knew? For a child who dismisses instantly the idea of a school dance as “stupid,” this is a revelation. If he’s not quite buying the argument that what he experienced is actually quite similar to a school dance, and that he might actually enjoy attending one, well at least he’s not dismissing it out of hand, either. Pleasant surprises really are the best, aren’t they? The types of the moments we live for with any of our kids — preparing for the situation, certain it will be a fight, planning our approach and arguments to *possibly* skirt the meltdown and then…no resistance whatsoever. For our kids to layer their enjoyment on top of that? Ecstasy.